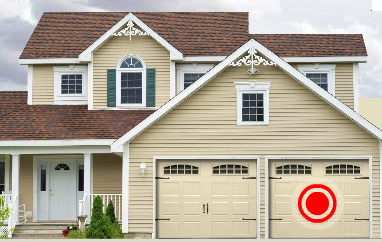 Are you shopping for a new garage door? You’ve done some searching on the Internet and you are wondering what “R-value” is, how it’s calculated and, more importantly, what you should buy to fit your needs. Let’s take a look at these questions step by step. A garage door needs to be more than well insulated – it also needs to be airtight. R-value is an imperial measurement of thermal resistance used in the building and construction industry. More precisely, the R-value is the measure of resistance to the flow of heat. 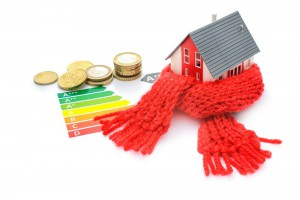 By using an insulating material, you can reduce the transmission of heat or cold. Thus R-value is used to show the energy efficiency of a product. This number is calculated as a function of thickness of the insulator and its physical properties. Finally, the larger the number, the better the thermal insulation of the door. For instance, R‑16 is better than R‑12. Are there different types of insulation used for garage doors? Yes. Two popular insulating materials are polyurethane and polystyrene. Also called Styrofoam, it is used to make disposable coffee cups or packaging materials, from “peanuts” up to preformed blocks for protecting major appliances. In terms of an insulator, for the same thickness of insulation, it has poorer performance than polyurethane (about half that of polyurethane). It is composed of chemicals which when combined expand to fill the space given. Polyurethane is used in many places, for instance in 1¾" (45 mm) entry doors. What do I really need? An insulated or non-insulated door? It all depends on how you will use your garage. Here are the questions you should ask yourself to properly determine your needs. 1- Is your garage attached or not to your house? If it is attached, it is best to choose a garage door with an R-value of at least R‑10. If it is detached and unheated, a lightly insulated or non-insulated door should be enough. 2- Is your garage insulated and you heat it, keeping the thermostat between 46 and 50°F (8 to 10°C)? In order to reduce your heating bill, it is best for you to choose a door with a value of at least R‑12. 3- How do you use your garage? Is the R-value the only thing to look closely at? The type of weatherstripping between sections: does it form an effective thermal break? 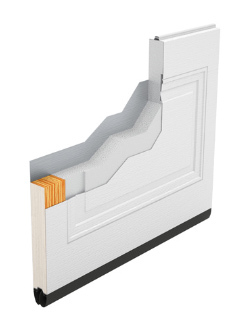 The weatherseal at the bottom of the door: is it flexible and resistant to intense cold? At the section ends: is there a thermal bridge? 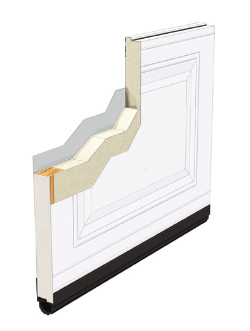 The exterior perimeter weatherstripping: is it soft and flexible even at -15°F (-25°C)? The thermal resistance value of a garage door doesn’t mean much if the door isn’t equipped with effective thermal breaks and suitable weatherstripping around and between the door sections. Without these weatherproofing features, the cold or heat will reduce the energy efficiency of the door.